It first flew on Friday, 16 July 1948 at Wisley, Surrey, England powered by Rolls-Royce Dart 502 engines. Vickers-Armstrongs (Aircraft) Ltd as G-AHRF. Damaged beyond economic repair landing at Khartoum Airport, Sudan 27 August 1952. This information came from the UK Civil Aviation Authority (CAA) World Airline Accident Summary. The gutted remains were reportedly buried in the sand. This seems very unlikely as the airport has been extensively developed over the subsequent years. Sir Ralph Sorley of Ministry of Aircraft Production (MAP) instructed his Director of Technical Development NE Rowe to arrange for Vickers to proceed with a development of the Brabazon 11B requirement. Type V.609 outline design requirements passed from the Ministry of Civil Aviation to Vickers-Armstrongs for a 24 seater / 3 flight crew aircraft with a payload of 7,500 lb at a range of 700 miles and a cruising speed of 240 kt at 20,000 feet. The aircraft must be capable of taking off on three engines within 1,200 yards and land within the same distance. Vickers submitted their proposal for the VC2 at an estimated cost of £58,000 powered by Rolls-Royce Dart engines. Specification 8/46 issued by the Ministry of Supply to Vickers for four Armstrong Siddeley Mamba powered prototypes but this was later reduced to two. Vickers VC2 registered to the Ministry of Supply. It was in the Flight Magazine 'Paris Aero Show' report that the Vickers VC2 was first referred to as the Viceroy. Vickers-Armstrongs announces that the type name of the VC2 is to be changed from Viceroy to Viscount. This change is due to the political changes in India resulting in an independent state within the British Commonwealth. Ministry of Supply approved the fitment of Rolls-Royce Dart Mark 502 engines in place of the Armstrong Siddeley Mambas before assembly was finalised. The airframe was built at Foxwarren, Surrey, England. The prototype was now known as the type V.630. Aircraft transferred by road from Foxwarren, Surrey, England to Wisley Airfield, Surrey, England for final assembly in 12 passenger configuration. This airfield was owned by Vickers. Aircraft rolled out at Wisley Airfield, Surrey, England in natural metal with no markings except for the registration. First flight from the grass runway at Wisley Airfield, Surrey, England piloted by Joseph 'Mutt' Summers and Gabe Robb 'Jock' Bryce. The flight lasted for twenty minutes around the local area. The only defect was a faulty fuel flow gauge for one of the Dart engine instruments. Mutt remarked after the flight that it was 'the smoothest and best flight I have ever flown', a comment that was to be echoed by thousands of airline pilots and tens of thousands of their passengers in the following years and decades to come. Introduced to the press at Weybridge Airfield, Surrey, England, now in a full Vickers-Armstrongs livery including flying demonstrations. Exhibited at the Society of British Aircraft Constructors (SBAC) air show at Farnborough Airfield, Hampshire, England including flying demonstrations with a total time of only 15 hours flying at that point. Flown to a French military airfield at Villacoublay, near Paris, France for demonstration flights. Civil registration cancelled and allocated military serial VX211. Civil registration cancelled and military serial allocated. Roundels applied to the Vickers-Armstrongs livery. Captain Mutt Summers took the aircraft to Hucknall Airfield, Nottinghamshire, England and Rolls-Royce staff, including Managing Director Mr E W Hives and Chief Development Engineer Mr R N Dorey were taken on a local demonstration flight. They were all very impressed on how quiet and smooth the flight was. Other Dart powered aircraft based at Hucknall at that time for flight trials were an Avro Lancaster and a Vickers Wellington. Registered to Vickers-Armstrongs (Aircraft) Ltd.
Re-registered from the Ministry of Supply - VX211 to Vickers-Armstrongs (Aircraft) Ltd for trials use. Exhibited at the Society of British Aircraft Constructors (SBAC) air show at Farnborough Airfield, Hampshire, England with British European Airways Corporation (BEA) titles, logo and Union flag applied to the basic Vickers livery. Restricted Certificate of Airworthiness (No.7796) issued after 290 hours and 160 flights which did not include the pressurisation or thermal anti-icing systems or tropical operations. This was the first C of A issued to a turbine transport aircraft anywhere in the world. Pressurisation trials carried out involving flights above 30,000 feet and emergency descents. During a demonstration flight to Aer Lingus from Collinstown Airport, Dublin, Ireland with George Edwards on board there was an incident near Dublin which could have been disastrous. Vickers test pilot Gabe Robb 'Jock' Bryce found that the elevators, ailerons and rudder became jammed as he reached 19,000 feet. He advised the Aer Lingus passengers to put on their seat belts due to 'bad weather' and requested that George Edwards should join him in the cockpit. Jock explained the serious situation to George and after they both attempted to move the controls Jock started to gently manoeuver the aircraft by reducing engine power. As he descended towards Dublin Airport the controls gradually became free and he was able to make a normal landing without the need to alert the control tower of his difficulties. The Aer Lingus representatives were unaware of the drama and were advised that the demonstration was cut short due to the impending bad weather. After the aircraft was pushed into a hangar puddles of water started to appear on the floor adjacent to both tailplanes and the rudder. Both Jock and George began to realise that the control problem had been caused by an ice build-up in the small gap between the elevators and rudder and the static tailplanes and tail fin. This gap was covered by a thin fabric which had frozen as the altitude increased. 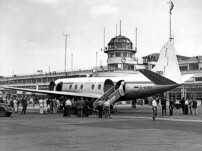 Both Jock and George were grateful that this design problem was found so quickly and hadn't resulted in a crash, which could have been disastrous for the Viscounts' reputation at such an early stage in its career. The fabric covering was deleted from this and all subsequent aircraft. Anti-icing trials were carried out, with the aircraft based at Shannon Airport, County Clare, Ireland. Over a three day period it flew out into the Atlantic at altitudes between 5,000 and 10,000 feet to locate areas of icing. A total of 10 hours flying was utilised in performing these trials which proved to be very successful. Departed from Wisley Airport, Surrey, England with the aircraft now painted in a new British European Airways (BEA) livery on a demonstration flight for the press, flown by Vickers test pilots Gabe Robb 'Jock' Bryce and Joseph 'Mutt' Summers. A Vickers Varsity flew along side with other press representatives on board with the emergency windows removed to allow photography and movie photography. The aircraft remained in BEA colours for the rest of its life. Departed from Northolt Airport, Middlesex, England on an eight European capital tour. 4,400 miles were flown by Vickers test pilots Gabe Robb 'Jock' Bryce and Joseph 'Mutt' Summers together with BEA Captain Wylie James Wakelin ex RNZAF which involving 61 flying hours and 70 landings. One sector was flown with two engines feathered during a descent to demonstrate the engines reliability and potential fuel economy measures at low altitudes, although this was later abandoned for safety reasons. Departed Wisley Airfield, Surrey, England to Blackbushe Airport, Hampshire, England, flown by Vickers test pilot Joseph 'Mutt' Summers and BEA Captain Richard 'Dickie' Rymer, who was the first airline pilot to have a turboprop endorsement on his licence. They were accompanied by Ministry of Supply Vickers 607 Valetta C Mk.1 VX541 on loan to Vickers flown by Brian Powell and Gabe Robb 'Jock' Bryce. Departed from Blackbushe Airport, Hampshire, England at 07:57 (local) for tropical trials at Khartoum Airport, Sudan and Eastleigh Airport, Nairobi, Kenya, flown by Vickers test pilot Joseph 'Mutt' Summers and BEA Captain Richard 'Dickie' Rymer. They were accompanied by Ministry of Supply Vickers 607 Valetta C Mk.1 VX541 on loan to Vickers flown by Brian Powell and Gabe Robb 'Jock' Bryce to carry all the support crew and equipment and described as a 'tender'. Mutt Summers and Jock Bryce swapped roles during the various test and demonstration flights. Representatives from Vickers-Armstrongs, BEA, Rolls-Royce and A & A E E Boscombe Down travelled with them. During the month of trials eighty takeoffs were performed using a new Water Methanol injection system developed by Rolls-Royce for the Dart engine. Arrived at Cote D'Azur Airport, Nice, France at 10:54 (local) from Blackbushe Airport, Hampshire, England. Departed from Côte D'Azur Airport, Nice, France at 13:05 (local). Arrived at Luqa Airport, Malta 15:42 (local). Departed from Luqa Airport, Malta 14:29 (local). Arrived at RAF El Adem, near Tobruk, Libya at 16:56 (local). Departed from RAF El Adem, near Tobruk, Libya at 23:38 (local). Arrived at Wadi Halfa Airfield, Northern Sudan 03:03 (local) . Departed from Wadi Halfa Airfield, Northern Sudan 06:21 (local). Arrived at Khartoum Airport, Sudan at 08:24 (local). A total of 2 hours 22 minutes of test and demonstration flying was carried out whilst based at Khartoum Airport, Sudan. Departed from Khartoum Airport, Sudan at 03:18 (local) on its way to Nairobi, Kenya. Arrived at Malakal Airfield, South Sudan at 05:07 (local). Departed from Malakal Airfield, South Sudan at 06:17 (local). Arrived at Kisumu Airfield, Kenya at 09:17 (local). Departed from Kisumu Airfield, Kenya at 10:05 (local). Arrived at Eastleigh Airport, Nairobi, Kenya at 10:55 (local). A total of 11 hours of test and demonstration flying was carried out whilst based at Eastleigh Airport, Nairobi, Kenya. A photographic sortie was carried out near Mount Kilimanjaro, (Kibo cone), Tanganyika. The photographs were taken from the removed port rear door position of Ministry of Supply Vickers 607 Valetta C Mark 1 VX541 which was flown by Vickers test pilot Brian Powell. They reached an altitude of 19,600 feet which was bitterly cold for the four on board, even those in the cockpit with the door shut. Departed from Eastleigh Airport, Nairobi, Kenya at 03:29 (local) on its way to Khartoum Airport, Sudan. At an early point during the flight the radios (WT) failed, so they returned to Nairobi at 06:04 (local). Departed from Eastleigh Airport, Nairobi, Kenya at 03:15 (local) on its way to Khartoum Airport, Sudan after the radios (WT) were repaired. Arrived at Malakal Airfield, South Sudan at 06:55 (local). Departed from Malakal Airfield, South Sudan at 08:16 (local). Arrived at Khartoum Airport, Sudan at 10:07 (local). A total of 13 hours of test and demonstration flying was carried out whilst based at Khartoum Airport, Sudan. Departed from Khartoum Airport, Sudan at 05:14 (local) on its way back to the UK. Arrived at Wadi Halfa Airfield, Northern Sudan at 07:18 (local). Departed from Wadi Halfa Airfield, Northern Sudan at 08:06 (local). Arrived at Cairo Airport, Egypt at 10:38 (local). Departed from Cairo Airport, Egypt at 15:20 (local) on a one hour demonstration flight with representatives from Misrair on board. Departed Cairo Airport, Egypt at 04:32 (local) to continue its journey back to the UK. Arrived at RAF El Adem, near Tobruk, Libya at 06:38 (local). Departed from RAF El Adem, near Tobruk, Libya at 07:59 (local). Arrived at Luqa Airport, Malta at 10:52 (local). Departed from Luqa Airport, Malta at 07:10 (local). Arrived at Cote D'Azur Airport, Nice, France at 10:14 (local). Departed from Cote D'Azur Airport, Nice, France at 12:16 (local). Arrived at Blackbushe Airport, Hampshire, England at 15:32 (local) and cleared customs. Departed from Blackbushe Airport, Hampshire, England at 16:37 (local). Arrived at Wisley Airfield, Surrey, England at 16:46 (local) after a successful completion of the tropical trials. The Vickers 607 Valetta C Mk.1 VX541 support aircraft (tender) arrived back at Wisley Airfield at 17:05 (local), having followed the same route home. The Valetta was eventually delivered to the Ministry of Supply 26 July 1950 with more flying hours than was normal for a new aircraft. British European Airways (BEA) approached Vickers-Armstrongs (Aircraft) Ltd and the Ministry of Supply with a request to carry out trial commercial operations on their London to Paris and London to Edinburgh routes. This would give them some more experience of operating a turbine aircraft prior to the introduction of the V.701 fleet and also find out what the passengers thought of it. Any shortcomings encountered with the V.630 would also help the development of the V.701 before it entered service. Full Certificate of Airworthiness (No. 7796 with Category Normal, Sub-divisions A,B, C, D, E, H and I) issued to allow BEA to carry out trial commercial operations. This allowed it to operate at a gross weight of 42,500 lb which gave it a disposable load of 12,031 lb. Delivered on loan to British European Airways (BEA) under contract. Loaned from Vickers-Armstrongs (Aircraft) Ltd to carry out trial commercial operations. It was ferried from Wisley Airfield, Surrey, England to Northolt Airport, Middlesex, England, arriving at 16:30. That evening they operated a proving flight to Le Bourget Airport, Paris, France with 17 BEA, Vickers and Rolls-Royce representatives on board and a fuel uplift of 655 imperial gallons. This 'trial run' allowed BEA to set up approach procedures with Air Traffic Control at Le Bourget for this new aircraft type. 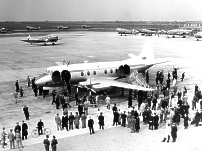 BEA operated the first turbine powered scheduled commercial flight as BE392X2 which departed from Northolt Airport, Middlesex, England at 12:48 to Le Bourget Airport, Paris, France. The flight was flown by Captains Richard 'Dickie' Rymer and Wylie James Wakelin ex RNZAF with Radio Officer I A Dalgleish, Steward C Dodds and Stewardess M Gunn. On board were 14 fare paying passengers who had booked thinking they would be travelling on a Vickers Viking. The first passenger to buy a ticket was a Miss J Allison from Australia. Other passengers included Captain A G Lamplugh of British Aviation Insurance Co Ltd, Norman Hill of Redifon Ltd and Mr D Murarji of Pan American Airways. Air Chief Marshal Sir Alec Coryton and F S Musgrave from the Ministry of Supply, Sir Arnold Overton who was the Permanent Secretary of the Ministry of Aviation, Air Commodore Sir Frank Whittle who invented the gas turbine aero engine and naturally George H Edwards the Chief Designer from Vickers-Armstrongs. BEA had Chief Executive Peter G Masefield, Flight Manager Captain J W G James and General Manager of Continental Services A H Milward. The 230 mile journey took 57 minutes at a cruise altitude of 18,000 feet and a cruising speed of 273 MPH. The return to Northolt took 66 minutes. A proving flight was made from Northolt Airport, London, England to Turnhouse Airport, Edinburgh with the return via Renfrew Airport, Glasgow to check out this airport as a suitable alternate. There were 14 fare paying passengers on board and 12 additional BEA crew members. 36 more return trips to Le Bourget Airport, Paris, France were carried out totalling 94:18 flying hours with 1,493 passengers carried. Forty years after the event on 29 July 1990, and knowing that Viscounts would not be flying for much longer, 'The Friends of Viscount Stephen Piercey' and British Air Ferries (BAF) set out to fly the route using V.806 series Viscount G-AOYN. Daily return flights commenced between Northolt Airport, Middlesex, England and Turnhouse Airport, Edinburgh, Scotland for the Edinburgh festival flown by Captains Richard 'Dickie' Rymer and Wylie James Wakelin. The journey time averaged 105 minutes compared with the DC3 time of 135 minutes. 322 passengers were carried during this period. There were also more flights to Le Bourget Airport, Paris, France during this period. BEA operated the aircraft for a total of 137 hours 57 minutes with 1,815 passengers carried. They experienced exceptional reliability of the aircraft and its revolutionary engines. The operations were supported by Rolls-Royce Engineers R Dann, E Fitzpatrick and D Heathcote together with Vickers Engineers J Bray, J Heap, S Pickett and J Wrenn. Returned to the Ministry of Supply. Returned from British European Airways Corporation (BEA) loan after a total of 127 flying hours in commercial service. Exhibited at the Society of British Aircraft Constructors (SBAC) air show at Farnborough Airfield, Hampshire, England still in the BEA livery but did not take part in the flying display. Vickers were advertising the production Viscount for £167,000.00 compared to the de Havilland Comet 1 for £450,000.00 and the de Havilland Dove for £17,500.00. 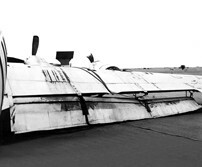 Damaged beyond economic repair when the starboard main undercarriage leg collapsed during a landing at Khartoum Airport, Sudan. The aircraft was being used for trials of various landing and navigation aids manufactured by several British companies. There were no serious injuries among the 3 crew and 2 passengers on board. A light alloy machined bracket securing the undercarriage leg radius rod to the rear spar had failed and the bolt pinning the radius rod to the bracket was also broken. Registration cancelled as the aircraft was written off. Due to its location it was considered to be beyond economic repair and had served its purpose. The success of the V.700 prototype (C/N 3) and potential orders also had an influence on this decision. After removal of all useful parts and equipment the gutted remains were reportedly buried in the sand. Remains noted by Central African Airways (CAA) flying mechanic Roy Downes inside a Sudan Airways storage compound. He robbed it of some sealing rings to rectify a leak on their CAA Viscount nose leg steering hydraulic system. An eyewitness stated: 'Its twisted skeleton still lies half buried in the shifting sands, a solitary monument to civil aviation among North Africa's many war-time graves'.